My Greater Victoria Real Estate Market Update is now available! "The Spring market for Greater Victoria real estate may have seemed a little more steady this year, people are getting used to the new tempo of brisk sales. Looking at long term numbers though we are still in a very active market, there is increased consumer demand and low supply. Each month this Spring experienced high sales, although they were lower than last Spring the sales numbers were generally the second highest after 2016, and well above the ten year average. We are seeing inventory slowly increasing, there were 1,916 active listings on the Victoria Real Estate Board MLS® at the end of June, 1% more than May, but 16.3% fewer compared to 2,289 active listings at the end of June 2016. 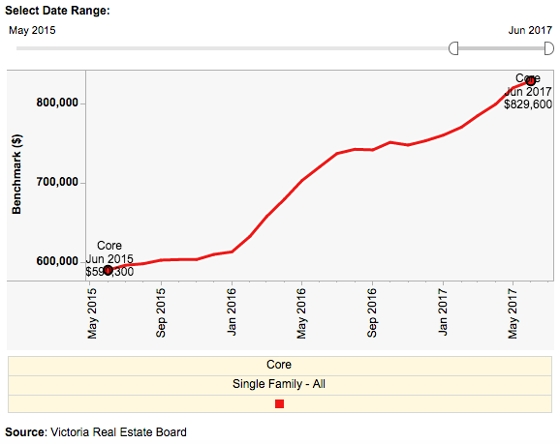 We may be getting closer to 2016 inventory levels, however inventory is still at record lows when you compare with 2015, at the end of June 2015 there were 4,003 active listings on the Victoria Real Estate Board MLS®. We currently have less than half the inventory of two years ago! The Bank of Canada raised interest rates this week for the first time in 7 years to 0.75%. We will see over the coming weeks how this affects the banks interest rates for mortgages, and if they do adjust them how much of the increase will be passed along to the consumer. CMHC insurance premiums also experienced a small increase in March. Victoria has been getting a lot of recognition lately on a Global level. Christie's International Real Estate and their affiliate in Toronto recently named Victoria as the second hottest luxury real estate market in the world behind Toronto. In 2016 we experienced an increase in multi-million dollar transactions and a decrease in the number of days on market. Oak Bay was also voted as the top three best places to live in Canada by Moneysense, and the best in B.C.!"